Viral is a recurring enemy and later an important ally to Team Dai-Gurren in the japanese anime Tengen Toppa Gurren-Lagann. He is a shark-type Beastman with feline genetics. His appearance is more humanoid than most other Beastmen, except for his cat-like eyes, shark-like teeth, and large clawed paws in place of hands. He is skilled in piloting Gunmen, as well as in unarmed combat. While hunting for food, he attacks Kamina when he found, running into his Gunmen Enki after Yoko intervene in a ensuing fight between the two. He manages to overcome Simon and Kamina's attacks, but leaves before the fight ends. The next day, Viral returns to execute his mission as member of the Human Execution Squad, facing Kamina and Simon again; this time however, Viral is defeated by the newly formed Gurren-Lagann, barraging it missiles in order to conceal his escape, swearing revenge on Kamina for his humiliation when he took Enki's helmet in the fight. Viral later returns alongside Supreme General Thymilph and the Dai-Gunzan to crush Team Gurren with the upgraded Enkidu, but is severely injured in the battle, which resulted in the Dai-Gurren's capture and the death of his superior. He tries to obtain another chance to fight by trying to join Supreme General Adiane's side, in spite of her treating him like garbage as she blames him for Thymilph's demise. Still, Viral saved Adiane from harm during a fight with Team Dai-Gurren, by stopping the Dai-Gurren's foot from crushing her. After Adiane's death by the Dai-Gurren's attack and being the only survivor of the Dai-Gunkai, Viral curses the Gurren-Lagann and swears to bring pain and punishment to those who killed his two superiors and robbing him of a honor. Under Supreme General Cytomander's command, Viral took part on the aerial attack on the Dai-Gurren. His battle with the Gurren-Lagann, piloted by Simon and Yoko, extended to the control room of Cytomander's aerial fortress, the Dai-Gunten. There, he learned of Kamina's death, and discovered that he not only lost to a human, but to a child as well, challenging Simon to a one-on-one duel in their mecha. But the battle was interrupted by Cytomander, who took Yoko hostage, and ordered Viral to destroy the defenseless Gurren-Lagann. However, Viral disobeyed as he knew this outcome would not make him regain his lost pride and honor. For this action, Cytomander asked the Spiral King's permission to execute him for treason, but Viral's last request was hearing from the King himself of what is the true nature of human race. Thus, Lord Genome dispenses Cytomander and conducts Viral to a room where he reveals the truth behind the Beastmen's existance before making him immortal. Viral's last effort against the Gurren-Lagann was in the Spiral King's throne room, where he believed he could finally obtain his vengeance after becoming immortal, but was soundly defeated. Lord Genome revealed that the reason he gave Viral immortality was not to fight against Simon, as none without "Spiral Energy" could stand against his power, but to make of him as an eternal witness of his triumph against Team Dai-Gurren. After Lord Genome's defeat and the fall of Teppelin, Viral's whereabouts were unknown, until he was sighted causing an uproar with his Gunmen, and demanding Simon to fight him, but Rossiu stopped Simon from going after him and sent their Guraparl force instead. Gimmy and Darry together managed to take down Viral's Enkidudu and put him under custody. When questioned by Simon about why he continues to fight even after the war ended, Viral stated that his intention was to protect a human settlement which refused to leave the underground. Simon would eventually discover that Rossiu was forcing people out of their villages without his consent, in order to count them to find out how close mankind's population was from reaching the one million danger level, stated by Lord Genome. Viral is sent to the Rikone prison and reappears in the end of episode 19, when he re-encounters Simon, who was imprisoned there, awaiting for his death sentence to be carried on. Both end up locked in individual cells after a brawl, but after Simon is rescued by Yoko, Viral is also released by him and accepts his proposal to join Team Dai-Gurren against the Anti-Spirals, as the Gurren's pilot. This position is cemented after the battle, when Simon declares him the Gurren's official pilot in a meeting with the Team members; this title goes uncontested. In episode 26, we discover that Viral's greatest desire is to have a family, however, this will always be impossible, since Beastmen cannot reproduce. Despite being a Beastman, he obtains a Core Drill when broken free from the Anti-Spiral's illusion, even though Beastmen should not be able to produce Spiral Energy. 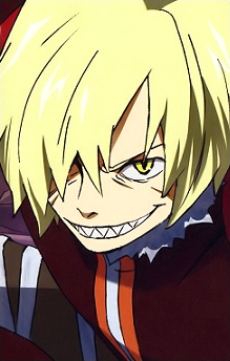 In the epilogue, Viral is seen commanding the Chouginga Dai-Gurren, as a representative for Earth, in the upcoming Spiral Peace Conference; due to his immortality, his appearance stays the same, in spite of the fact that 20 years had passed. Viral's name comes directly from the word "viral", tying in with the Beastmen's genetics theme, but there are other theories about his name's origin. One is the fact that it can also be an anagram for "rival", referring to his constant rivalry with Kamina, which transfered to Simon throughout the series until near the end. Another possible theory comes from the Nikopol Trilogy of comic books written by Enki Bilal, as Enki is the name of Viral's first Gunmen and "Bilal", pronounced in Japanese, sounds like "Viral". Supporting this theory is Viral's theme song, which is titled "Nikopol", on the anime's soundtrack. The name of Viral's Gunmen may be tied to the Sumerian diety Enki, though it is much more likely that there is a deliberate connection between his second Gunmen, Enkidu, and the character of Enkidu from the Epic of Gilgamesh. The myth consists of Enkidu ('Enki's creation'), a man of the wild who seeks to challenge King Gilgamesh, a mighty warrior, but who later befriends him and assists him in in his travels.